The year 1998 was the 400th anniversary of the death of Toyotomi Hideyoshi, the low-born soldier who through ferocious guile and acumen succeeded in unifying all Japan. Though a brilliant military strategist and politician, Hideyoshi ended his days in megalomaniacal paranoia that led to a rash of forced suicides — including those of his heir apparent and his beloved tea master — plus innumerable women being immured in nunneries. He was as complex an historical figure as Japan has ever produced, and the anniversary predictably spawned a immense number of media profiles. But for me the distillation of the man comes from a woodblock print published in the early 1830s in Osaka — the city the military hegemon built and ruled the country from. One reason I value this piece (illus.) is that it exhibits in full-size ôban format (approx. 26 X 37 cm) the kind of delicate carving and printing usually associated with small, precious "surimono." The rich pigments were chosen with sensitivity and the woodblocks got liberally sand-papered to produce exquisite gradations. There is also thread-like silver filling in the patterns left by blind embossing — creating a minute inlay effect — and in the correct light other coruscating metallic pigments appear throughout the armor. All this calls to mind Hideyoshi's showy extravagance and taste for gold. In addition, the heavy black outlines so typical of ukiyo-e have been largely abandoned, as has the tendency to fill the top half of the sheet with a titles, names and panegyric poems and notes — absences that remind us of the warlord's impatience with formality. More important than all this, though, is that the print embodies as many mysteries and contradictions as Hideyoshi himself. To start with, why was it produced? Apart from the occasional toy print for children, and one notable manga-like farcical series (see Giga article), the Osaka ukiyo-e world all but ignored prints dealing with samurai. 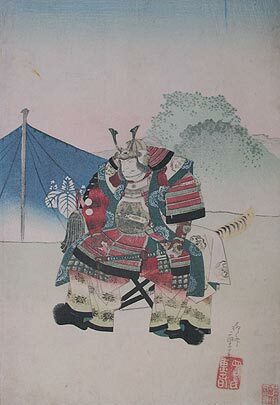 This genre (termed musha-e) was important in Edo, especially after the rise of Kuniyoshi in the late 1820s, but Edoites lived surrounded by the shogun and his enfeoffed vassals, so the fashion made sense there. In Osaka, on the other hand, far away from warrior chic, the merchants didn't even like their Kabuki to feature scenes of manly bravura. In fact, this may help explain Hideyoshi's quiescent pose, one in which the finely detailed epaulets, the gorgeous silk pantaloons, and even the camp stool and tiger skin cover for the sword command as much of our attention as the generalissimo's face. Then again, those responsible for the print may have worried that a more heroically dynamic Hideyoshi would arouse the pique of Tokugawa censors. Whatever the inspiration for the pose, what a far cry from the ferocious demeanor of the classic Kuniyoshi warrior! The print is signed Shigeharu, an Osaka artist (1803-53), but it bears no mark of a commercial publisher. Instead, there is a seal, disappearing in the lower right hand corner, belonging to "Kasuke, master engraver of surimono." This suggests that the work was a private commission, but, again, for what purpose? Who would have underwritten such an expensive project when there was no precedence (and presumably no stomach) in Osaka for even a cheap edition of musha-e? To be sure, the full extent of the outlay for this one-of-a-kind effort is still unclear. Hideyoshi on his stool represents only the far-right image of what was at least a five-sheet composition. I write "at least" because while my set has only four other pieces, (and so does the only other set I've encountered), the phrase "The Seven Arrows" appears next to the name of the lone samurai depicted on each of these four sheets. (Long, long before Kurosawa, "The Seven Arrows" was the appellation given to Hideyoshi's seven trusted generals.) Such an inscription leads us to surmise there should be eight ôban in all. Also, the samurai in the last of the five sheets faces left, out into nothingness with his back to us and to Hideyoshi. This could be appropriate if he is supposed to be standing guard, but then why is the artist's signature and seal on that page in the lower right corner? They are invariably on the outside edge of a final left-hand sheet to ensure a balanced design. Did the backers, in the middle of production, run out of money? Or perhaps historical zeal? Ah, the fun of speculative twists and turns goes on forever ... as it does regarding Hideyoshi himself. This article originally appeared (with slightly different content) in Daruma, no. 23, Summer 1999. Copyrighted © text and pictures reprinted with permission.